No. 11 was occupied by Thornton's bookshop from 1870 to 2002. The building dates from about 1800, and is Grade II listed (ref. 1485/170). Joseph Thornton opened his first bookshop in Magdalen Street in 1835, and moved to 51 High Street in 1840. In 1853 he moved back to Magdalen Street, and in 1863 to 10 Broad Street next door to this shop. In 1870 he moved to No. 11, and his bookshop continued to flourish here as a family firm for over a hundred years. In 1772 a survey of every house in the city was taken in consequence of the Mileways Act of 1771. 5 yards 1 foot 10 inches. assistant. The two teenage drapers live by themselves in the house with a servant and a lodger. The 1881 census shows Joseph Thornton, who was born in Billericay, as the employer of one man and three boys. Aged 74, he was living over this shop with his wife Clara and daughter Lydia (a governess), and one general servant. His son James was managing a bookshop of his own at 33 High Street at this time.This bookshop, also a publishing house later merged again with the original firm. The business remained in the family until 1983, when it was about to go bankrupt. Wim & Scharlie Meeuws of Holdan Books bought it from John (known as "Young Jack") Thornton, the fourth generation Thornton (although John explained that he should really be regarded as the fifth generation since Joseph started the business with money from his father, a vicar ) The Meeuws family altered the shop between 1983 and 1985 to meet fire regulations. 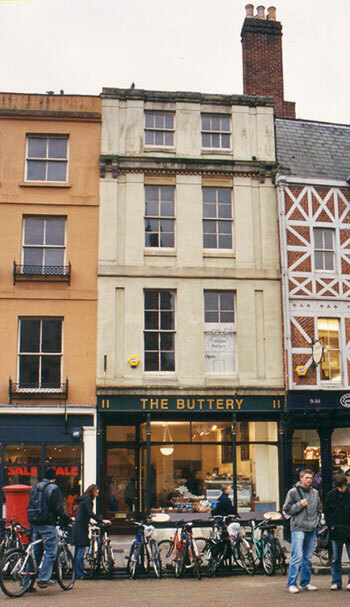 The Thornton's name remained in Broad street until the business finally moved out on 1 January 2003, making place for the Buttery owned by the Moss family. 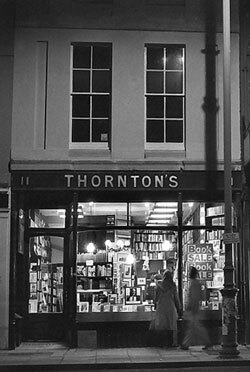 Thornton's Bookshop still survives as a mail order and internet company in Cowley / Oxford and Faringdon / Oxfordshire.